Early on the morning of October 24, a group of Trident Ploughshares activists from across the U.K. converged on Burghfield Atomic Weapons Establishment near Burghfield. They blocked approach roads, preventing workers from entering. Hidden in the leafy lanes of Berkshire, Burghfield A.W.E. 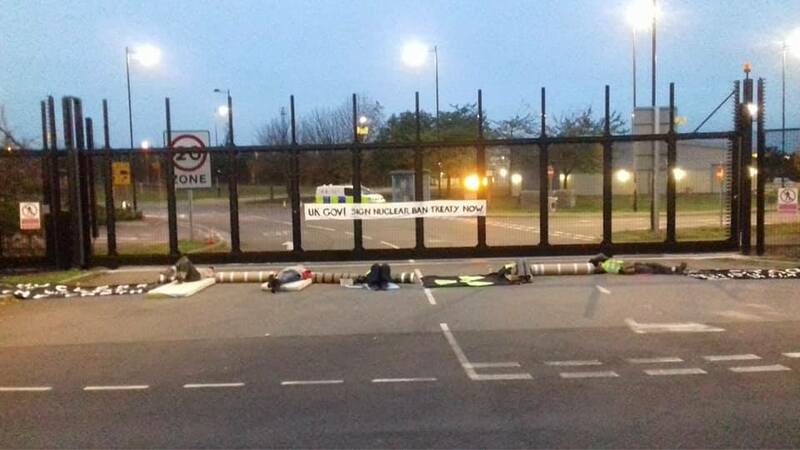 and its partner facility Aldermaston are where the U.K.’s nuclear warheads are planned and produced before being loaded onto lorries for trucking up public roads to the Trident submarine fleet in Scotland. 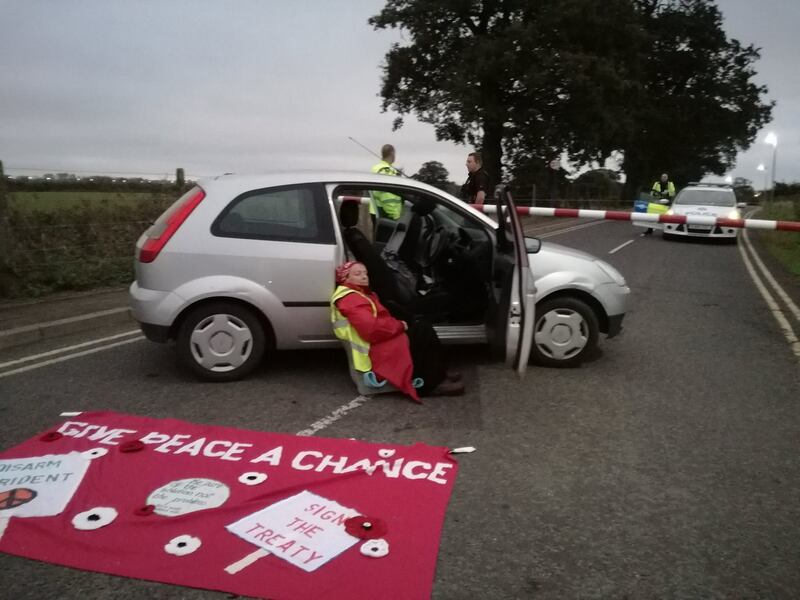 The Mearings, a private road with access to the Main gate of AWE Burghfield, was blocked at both ends by a car with two people locked to it. The construction gate has a line of five people locked across it with their arms in lock-on tubes. Some of the blockaders were still locked across the road at the end of the day. 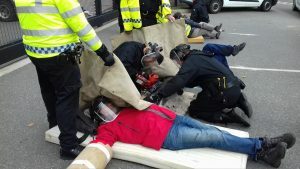 The police continued to work to remove them from the car they were attached to, having earlier cleared people from the other two entrances. 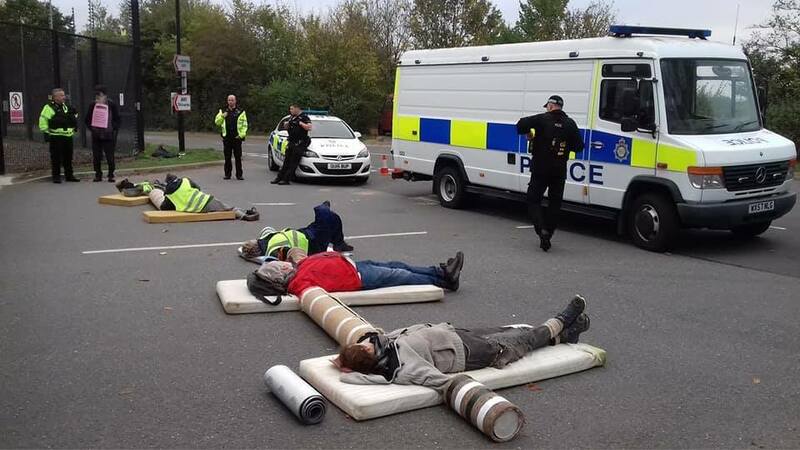 Eventually, all nine activists were arrested and charged with obstruction of the highway. This day, the 24th of October, is special in marking 73 years since the birth of the United Nations. The U.K. government has totally failed to have anything to do with the ground-breaking U.N. Treaty on the Prohibition of Nuclear Weapons. At North Mearings:  Julia Mercer – Leintwardine and Awel Jones – Llanfrothen, Gwyned. At South Mearings:  Chris Bluemel – Southampton and Cat – Glasgow. At the construction gate:  Jane Picksley – Scotland, Jim Davies – Liverpool, Jan Jones - West Wales, Brian Jones - West Wales and Marie Walsh - Didcot.